You can link to or import data from an SQL Database, which is a high-performing managed database used for mission-critical applications. For more information, see SQL Database – Cloud Database as a Service. When you link to data, Access creates a two-way connection that synchronizes changes to data in Access and the SQL Database. When you import data, Access creates a one-time, copy of the data, and so changes to data in either Access or the SQL Database are not synchronized. Locate the Azure SQL Server database server name, identify necessary connection information, and choose an authentication method (Windows or SQL Server). For more information on the four methods of authentication, see Connect to Server (Database Engine) and Securing your database. Identify the tables or views that you want to link to or import, and uniquely-valued fields for linked tables. You can link to or import more than one table or view in a single operation. Consider the number of columns in each table or view. Access does not support more than 255 fields in a table, so Access links or imports only the first 255 columns. As a workaround, you can create a view in the Azure SQL Server Database to access the columns beyond the limit. Determine the total amount of data being imported. The maximum size of an Access database is two gigabytes, minus the space needed for system objects. If the Azure SQL Server database contains large tables, you might not be able to import them all into a single Access database. In this case, consider linking to the data instead of importing. Secure your Access database and the connection information it contains by using a trusted location and an Access database password. This is especially important if you choose to save the SQL Server password in Access. Plan for making additional relationships. Access does not automatically create relationships between related tables at the end of an import operation. You can manually create the relationships between new and existing tables by using the Relationships window. For more information, see What is the Relationships window? and Create, edit or delete a relationship. Create an Azure account. For more information, see Create your free Azure account today. If you don’t have convenient access to an Azure SQL Server database, you can create your own. For more information, see Create an Azure SQL database in the Azure portal. Make sure you retain important information so you don’t forget it, such as credentials and account names. If your public IP address is static, then it is consistently the same. You can specify a firewall rule with a single public IP address. If your public IP address is dynamic, then it can change over time. You need to specify a firewall rule with a range of public IP addresses. Bear in mind that the public IP address used by your device to connect to Azure SQL Database may be different than the public IP address shown in your computer public IP configuration settings. To avoid confusion, we recommend using the following procedures. Log into your Microsoft Azure account, and navigate to the Windows Azure portal. On the Microsoft Azure SQL Databases page, click your database. Create a firewall rule for a single device Use this approach for testing and development, or in a small business environment, and when you know that your public IP address is static. In the Allowed IP Addresses section, select Add to allowed IP addresses to enable your public IP address to access the database though the firewall. The Azure portal displays the correct public IP address for your client device above the rule names section. Create a firewall rule for a range of IP Addresses Use this approach to enable access for many users in an on-premises environment, or when you know your public IP address is dynamic. Contact your IT department or your Internet Provider to obtain a block of public IP addresses. Under RULE NAME, enter a meaningful name for the rule. Under START IP, enter the beginning public IP address number of the range. Under END IP, enter the ending public IP address number of the range. It may take up to five minutes for the firewall rule to take effect. For more information, see Azure SQL Database firewall rules. Select External Data > New Data Source > From Database > From SQL Server. To import data, select Import the source data into a new table in the current database. To link to data, select Link the data source by creating a linked table. You can create a DSN file or reuse an existing one. Use a DSN file when you want to rely on the same connection information for different link and import operations or to share with a different application that also uses DSN files. 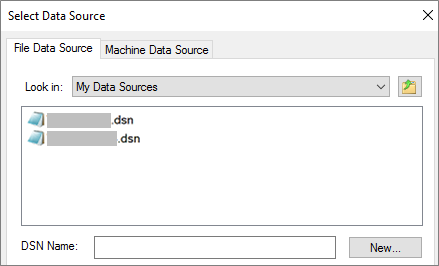 You can create a DSN file directly by using the Data Connection Manager. For more information, see Administer ODBC data sources. Although you can still use prior versions of the SQL ODBC driver, we recommend using version 13.1, which has many improvements, and supports new SQL Server 2016 features. For more information, see Microsoft ODBC Driver for SQL Server on Windows. If the DSN file you want to use already exists, select it from the list. Depending on which authentication method you entered in the connection information, you may need to enter a password again. 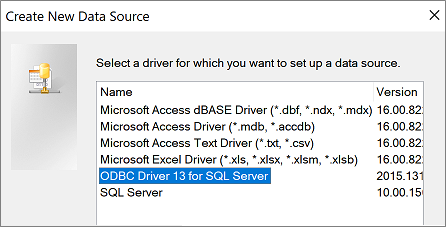 Select ODBC Driver 13 for SQL Server, and then select Next. Enter a name for the DSN file, or click Browse to create the file in a different location. Click Next to review the summary information, and then click Finish. In the Description box, optionally enter documentary information about the DSN file. In the Server box, enter the name of the Azure SQL Server Database. For example, enter "myAzureDB.database.windows.net". Do not click the down arrow. With Integrated Windows authentication Connect through a Windows user account. Optionally, enter a Service Principle name (SPN). For more information, see Service Principal Names (SPNs) in Client Connections (ODBC). With SQL Server authentication… Connect with credentials that have been set up in the database by entering the login ID and password. With Active Directory Integrated authentication Connect to the Azure SQL Server Database by using Azure Active Directory. Once you have configured Azure Active Directory authentication, no additional login and password is required. For more information, see Connecting to SQL Database by Using Azure Active Directory Authentication. With Active Directory Password authentication… Connect with credentials that have been set up in the Azure Active Directory by entering the login name and password. For more information, see Connecting to SQL Database by Using Azure Active Directory Authentication. On pages three and four, select various options to customize your connection. For more information about these options, see Microsoft ODBC Driver for SQL Server. A screen appears to confirm your settings. Select Test Data Source to confirm your connection. You may need to login to the database. In the SQL Server Login dialog box, enter the login ID and password. To change additional settings, select Options. In the Link Tables or Import Objects dialog box, under Tables, select each table or view that you want to link or import, and then click OK. In the Get External Data - ODBC Database dialog box, you can save the import steps as a specification and create an Outlook task to automate the import operation on a regular basis. For more information, see Save the details of an import or export operation as a specification. When a link or import operation completes, the tables appear in the Navigation Pane with the same name as the SQL Server table or view combined with the owner name. For example, if the SQL name is dbo.Product, the Access name is dbo_Product. If that name is already in use, Access appends "1" to the new table name — for example, dbo_Product1. If dbo_Product1 is also already in use, Access will create dbo_Product2, and so on. But you can rename the tables to something more meaningful. In an import operation, Access never overwrites a table in the database. Although you cannot directly append SQL Server data to an existing table, you can create an append query to append data after you have imported data from similar tables. In a link operation, if columns are read-only in an Azure SQL Server table, they are also read-only in Access. Access data types are differently named from azure SQL Server data types. For example, an Azure SQL Server column of the bit data type is imported or linked into Access with the Yes/No data type. The following table compares Azure SQL Server and Access data types. See Using the Large Number data type.